Apple cider moonshine sure sounds like a fun way to play around with your still. However, with this recipe we won’t be distilling any apple cider, sorry. 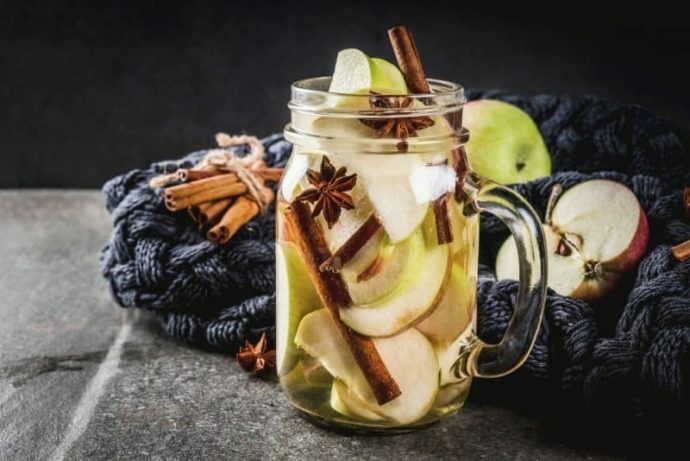 We’ll be mixing the tasty moonshine you should already have at hand with apple cider and some extra ingredients with the goal of having a bright and pronounced apple flavor in the final drink. Maybe this doesn’t sound as exciting as distilling moonshine from hard apple cider, but wait until you taste the final result! And take another shot for good measure! A great infusion to test out your 'shine! Pour apple cider and apple juice into a pot, bring to about 150°F. Mix in white and brown sugar until completely dissolved. Add cinnamon stick and whole clove, reduce heat to medium low and simmer for 20 minutes. Mix in moonshine and vanilla vodka into the cooled mixture. If 'fer some reason you don’t have any moonshine in the stash, you can make do with store-bought high-proof spirit such as Everclear or similar but you'll definitely miss out on the wow-factor!